If you are under age 18, or want to find the BMI and appropriate weight for a child, please use the Childhood BMI Calculator. BMI uses a mathematical formula based on a person’s height and weight. Several government authorities use it when assessing overweight and obesity levels in the population. 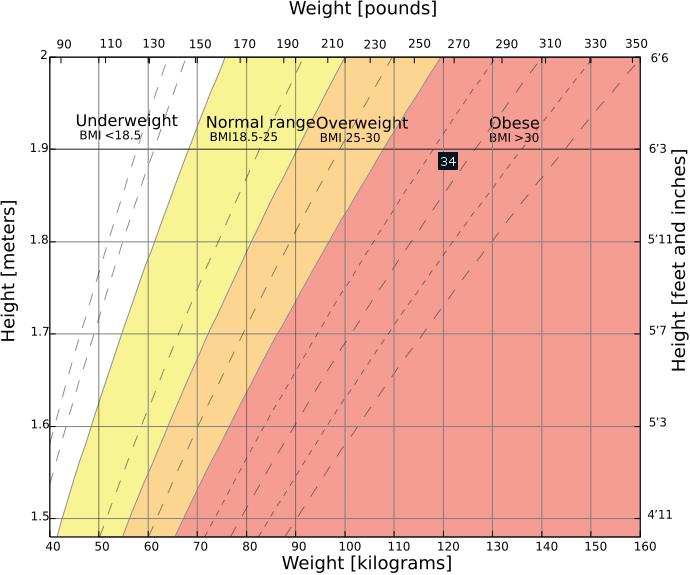 BMI equals weight in kilograms divided by height in meters squared (BMI = kg/m2). A BMI of 25 to 29.9 indicates a person is overweight. 30 or higher is considered obese. The BMI does not measure body fat levels – so you could be rippling with muscle – and BMI will show obese. BMI does not show the difference between excess fat and muscle. In children, waist measurement (and weight-to-height ratio) is a better predictor of cardiovascular disease than BMI. Take your BMI reading with a grain of salt. If a bodybuilder measured their BMI, they would show up as obese. This is obviously not true. It is difficult to apply a "one-size-fits-all" to unique body types. Some ethnic groups also have denser and heavier bone structure which can skew the results even more. BMI is also inaccurate for short or tall people – short people will think they are thinner that what they are, and tall people will have a higher BMI reading. However, for the general population, BMI is an easy assessment of weight categories. We recommend using the Body Fat Calculator instead. The BMI classifications apply for the entire population. However, some ethnic groups, such as Asians, should not necessarily have the same classifications. Asian people with diabetes and cardiovascular disease risk have this at BMIs lower than the cut-off point for overweight (BMI 25).